Solange Knowles Is Married! See Her & Alan Ferguson Ride Bicycles To The Church! This is about as amazing as it gets! Solange Knowles and her hubby Alan Ferguson officially tied the knot on Sunday at Holy Trinity Church in New Orleans in front of around 100 people! And yes, Jay Z was there with Beyoncé and Blue Ivy too, all whom were dressed in white. But we're loving what Solange is wearing so much, we can't move on from it! A cream colored jumpsuit? Yes please! 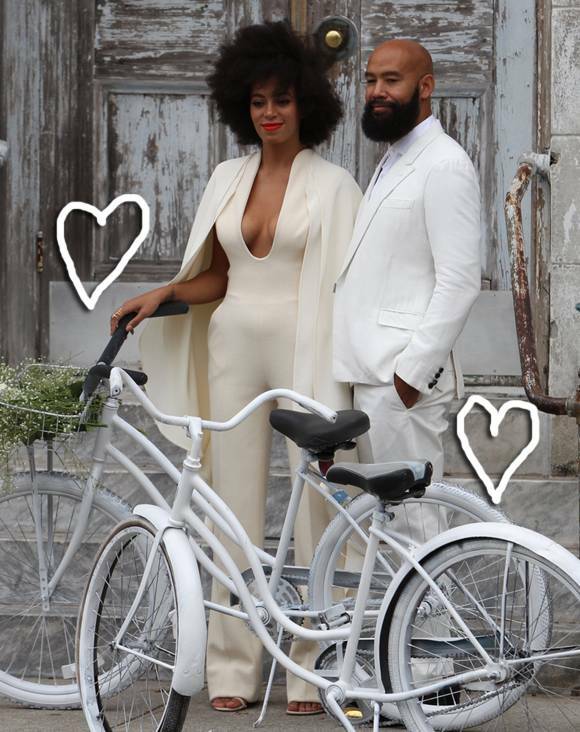 It's perfect for biking to the church too, which is exactly what Solange and Alan adorably did for their big entrance! So much for not seeing the bride ahead of time though! Oops! Afterward, the family all took photos together, and momma Tina Knowles was holding her boyfriend's hand. Maybe she'll be next! As for Solange's son Juelz, from her first marriage, he played a part in the ceremony as well. We wish these two a lifetime of happiness!